Various technologies and approaches have been used to attempt to reduce or eliminate the boarding gap between BRT buses and BRT station platforms. In high floor stations higher than 75cm, gaps must be minimized as a safety issue given the distance passengers could potentially fall. In lower floor systems, such as the 35cm platform height typical in China, there is less pressure to stop very close to the platform, but large boarding gaps make boarding slower, more difficult, and less safe. 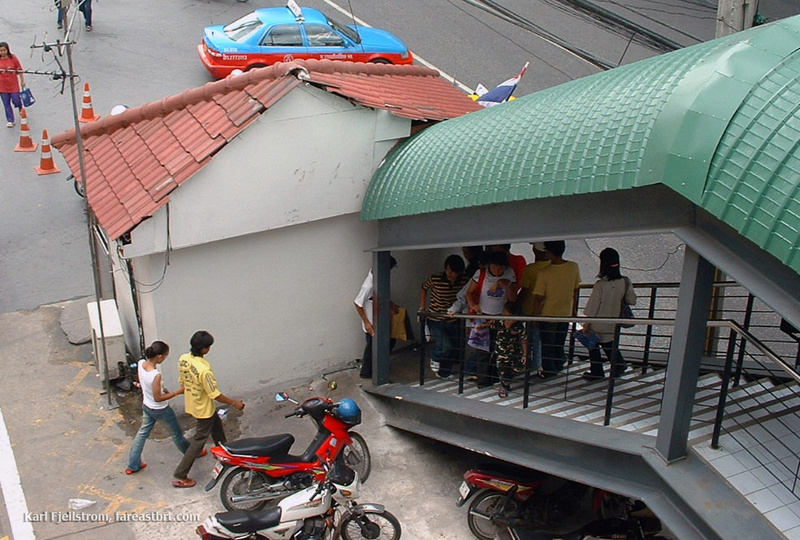 Meanwhile the trade-off for stopping closer to the station platform is that drivers need to approach the station more carefully, driving more slowly to achieve closer docking distances. If stopping distances are larger, boarding times per passenger are slower and hence overall system capacity and speed may be reduced. If closer docking is required, boarding times per passenger can be faster but at the cost of slower station approaches, which also adversely impacts system capacity and speed. Drivers can approach at a speed associated with a somewhat larger gap, while passengers can enjoy the benefits of a very close station docking, all without any additional delay. The approaches used to reduce the boarding gap include driver training, visual aids for drivers (which may be as simple as a strip of tape on the station which lines up with a strip of tape on the bus window next to the driver), precision docking technologies (which have approximately the same effect as the strip of tape approach but cost millions of dollars more), padding from rubber-like material, Kassel kerbs or similar variations which enable drivers to stop closer to the platform, and platforms which fold down or extend from the BRT bus. Folding platforms are used in BRT systems such as Quito, Cape Town, Nantes and Curitiba, and generally provide excellent access for all passengers including those in wheelchairs. However, folding platforms are not widely used because of the trade-off required in additional time for the platforms to deploy, and the additional maintenance requirements. Boarding gaps and approaches used in various BRT systems. 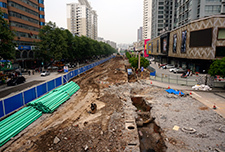 A new technology deployed in the Yichang BRT system may address this problem in systems with sliding BRT station doors in a way that avoids the trade-off in station approach speed and boarding & alighting speed. Drivers can approach at a speed associated with a somewhat larger gap, while passengers can enjoy the benefits of a very close station docking, all without any additional delay. 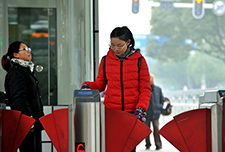 Developed over a 13 month period of research and development by sliding door system vendor Jiangsu Huimin Transportation Equipment Co., this approach involves a platform which extends from the BRT station platform outward to the bus during the time the station sliding doors are opening. A sensor detects the distance to the stopped BRT bus, which in turn instructs the platform how far to extend. Photos below show the system in operation. 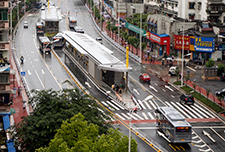 The extending platforms were implemented as a test in one BRT station in Yichang and have performed well for the initial months of operation of the Yichang BRT, with more testing to follow. Field observations during the initial testing and operation indicate that the techonology is robust. The platform extensions cost around $1,300 (8,560 yuan) per set, including installation cost, and can be installed in a day. Foundation and pipeline embedding, and installation and adjustment each takes around four hours. Extension and retraction time is 1.5 seconds +/- 0.3 seconds, which is less than the opening time of the sliding doors, meaning no additional time is required in stations which feature sliding doors. The bearing capacity of the extension is 300kg. The embedded frame material is galvanized pipe, with both step frame and step material made of aluminium. The border lining is aluminium honeycomb board. The operation of the door extension starts with a BRT bus arriving at the BRT station and stopping in the parking position. The driver presses the button controlling opening the bus door, and at the same time the vehicle controller detector detects the signal of the opening door, and a radio frequency transmission of the control signal to the platform receiver is received by the corresponding control signal. The platform receiver automatically measures the distance between vehicle and station kerb, and then quickly and smoothly extends the platform outward to connect the vehicle and the platform, at the same time as the station sliding door is opening. Passengers can then rapidly board and alight. 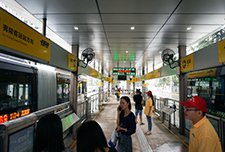 When boarding and alighting is completed, the driver presses the button which closes the vehicle door, and the station sliding door closes at the same time, along with the electric retractable platform extension. The BRT bus leaves the station. Field observations during the initial testing and operation indicate that the techonology is robust. The station where the door extension is installed is Pinghu station in the northern Yiling District portion of the BRT corridor. This station was selected because it is in on a curve, which makes it more difficult for buses to stop very close to the platform. More testing is required, though the initial signs are positive that this new innovation could become a standard component in BRT stations with sliding doors. Platform extension in operation in the Yichang BRT.